I like make-up, what of it? One of my favourite things about Japan is the extreme specialisation and pride that people take in their work -- even the most seemingly menial tasks are executed diligently and beautifully. I went to a gyoza restaurant recently (one of the tiny one room mom and pop shop type places) and watched in awe as the old man behind the counter churned out hundreds of dumpling shells. He must have done it every day for years, and he did it with such perfection. There was no sense of the mundanity of a repetitive task, but rather someone performing their chosen craft. I have a real soft spot for this side of Japanese life. I quite often see restaurants and shops which only sell one thing and never seem to have any customers. They must be entirely financially unviable, but are clearly the product of a dearly held dream -- run for love not money. I also love the regional specialisation (I believe this is called meibutsu). Some people dislike this as they see it as perpetuating the omiyage culture (obligatory gift-buying whenever you go on holiday which seems to function almost as repentance for letting your work colleagues down by your absence), but I love the sense of pride and quality that it encapsulates. Small-scale regional manufacturers turning out hand-crafted wares also means small production runs, limited availability and high price points, which I think helps engender the cult status of many Japanese-made goods. For example, Japanese denim, produced on small looms in Kojima, Okayama prefecture, is considered by many to be the best in the world (for more information see this SOAS research piece). Similar cult status is afforded to Japanese make-up brushes. The town of Kumano, near Hiroshima, is famous for the production of hand-made brushes (not just make-up tools, also calligraphy and art brushes), known as Kumano Fude. There are around 30 different brush companies based in Kumano. The brushes are so prized because the highly-skilled craftsmen hand select the (usually uncut animal) hairs for each brush to produce perfectly weighted, beautiful quality brushes. Each stage of the process is typically performed by a specialised craftsman -- from hair selection to bundling the head, producing the handles, attaching the ferrule and so on. For more information on the history and manufacture process see the Kumano Fude website. The best known Kumano companies are probably Hakuhodo and Chikuhodo. As well as producing their own-brand brushes, they also make them for a number of other companies. For example, Suqqu, RMK and Kanebo brushes are made by Chikuhodo and Hakuhodo produces brushes for Tom Ford (and formerly MAC). Drivel About Frivol for a number of really helpful comparison posts. Hakuhodo brushes are fairly widely available across Tokyo. There are counters at a number of department stores, including Mitsukoshi Ginza and Tobu Ikebukuro (see my department store guides here and here). However, the counters only carry a small number of the huge range of Haku brushes so if you have time I highly recommend paying a visit to their Aoyama boutique in Omotesando. As with most places in Tokyo, it's quite difficult to find and it's almost essential to have a Google Maps app. A bonus is that once you do finally find it, the shop is just down the road from the excellent Kua 'Aina Hawaiian burger cafe. The Omotesando shop sells the full range of brushes, which is extensive -- as you can see from my dodgy iPhone pics below. Until recently it wasn't possible to buy Chikuhodo brushes in Tokyo other than at the occasional temporary pop-up stand in major department stores. Fortunately last summer they opened a counter at the TAU Hiroshima brand shop in Ginza. The Kumano Fude shop on the 2nd floor sells a selection of brushes produced by Chikuhodo, Koyudo, Tanseido, Kyukasangyo, Nakamura and Mizuho Brush. This is a genuinely fascinating little shop. I find the staff unfailingly helpful. They also let me play with the Kiwami set so I obviously love them. The shop doesn't carry every single Chiku brush, but they do have a good selection and stock most of the Artist and Z series. 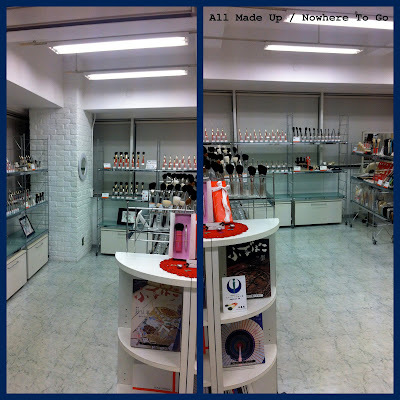 Note that Chikuhodo still have the travelling department store counters. Details of these are listed on their website under 'What's New' (non-Japanese speakers will need to use Google translate). I use the term 'beauty destination' fairly loosely for Kyoto, because of course there are so many wonderful and beautiful sights to be seen that make-up shopping is probably not very high up most people's to-do list. However, not every visitor to Japan travels via Tokyo so I thought it might be useful to show what you can find in Kyoto. There are also a couple of Kyoto-exclusives that are worth a little look. 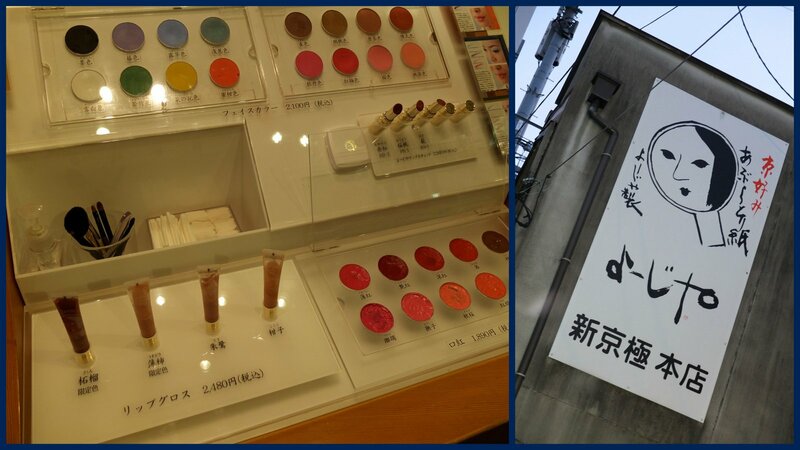 In terms of general beauty shopping, Kyoto has a few department stores. There is a branch of Isetan in the station which stocks Helen Rubenstein, Anna Sui, RMK, Shu Uemura, Kanebo and more. It also has a little offshoot (Suvaco Isetan) which houses drugstore lines plus mid-range brands including MAC and L'Occitane. Downtown Kyoto is the most obvious place to head for department store shopping. 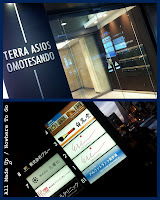 Here you will find Takashimaya and Daimaru, which between them stock most major beauty lines. Note that, as far as I know, neither Addiction nor Suqqu are available in Kyoto. My other most favoured Japanese brand, THREE, has a small counter in Takashimaya. There is also a branch of OPAQUE in Downtown Kyoto which sells a selection of 'natural' beauty lines including Jurlique, John Masters Organics and Erbaviva. For drugstore products and other curiosities head to LOFT. Kyoto's most famous beauty brand is Yojiya, which was founded in 1904 and is probably best-known for its blotting papers. There are a number of Yojiya stores dotted around Kyoto -- you can spot them by looking for the mirror/head logo. Other than at a couple of counters at Narita, Haneda and Kansai airports, Yojiya products are not available outside Kyoto. The Yojiya website has a full list of the Kyoto store locations. There is one in Downtown Kyoto and a large store in Gion. There is also a pretty shop and garden just off the Philosopher's Walk en route to Ginkaku-ji (for me the most beautiful of Kyoto's temples). As well as the blotting papers, Yojiya also produces a number of skincare products plus some colour cosmetics and brushes. I only saw the make-up and brushes on sale in the Gion store. I was most interested in the lip creams, but skipped them as they seemed too sticky to double up as cream blushers. See Messy Wands for reviews of a Yojiya lipstick and cheek brush. Also just off the Philosopher's Walk is Chidoriya, which sells a range of natural/organic Japanese beauty products and accessories. Chidoriya products are carried by a number of stores in Tokyo and the US, but the only free-standing store is in Kyoto. There is also a little salon next to the shop. I had to work quite hard not to buy everything in this shop. I managed to limit myself to the Nail Treatment Oil, which is lovely (if very expensive). Interestingly for a brand which markets itself as selling Japanese products, an awful lot of them are made in the USA (including the nail oil). Make-up aside, this post is really just an excuse for me to spam you with some photos from my most recent trip to Kyoto. 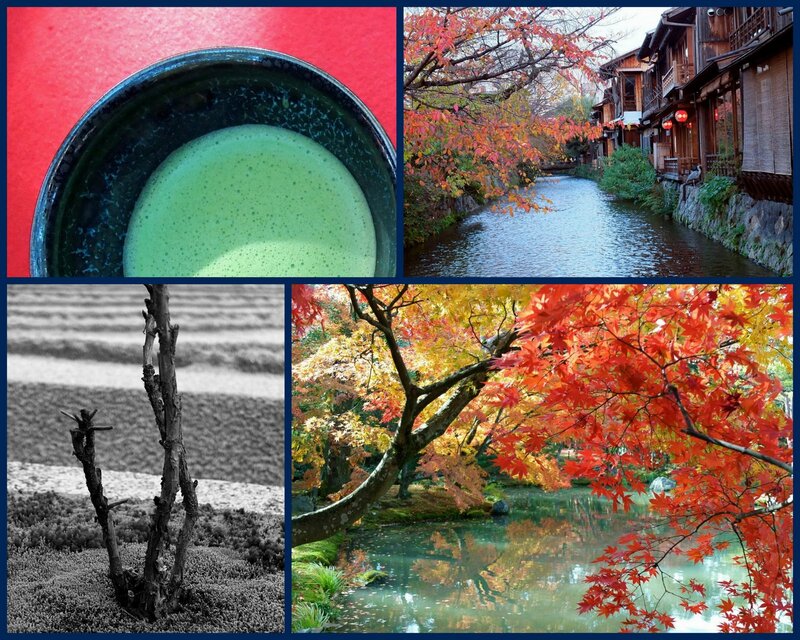 I went in November at the height of koyo season -- it was gloriously beautiful (if very crowded). 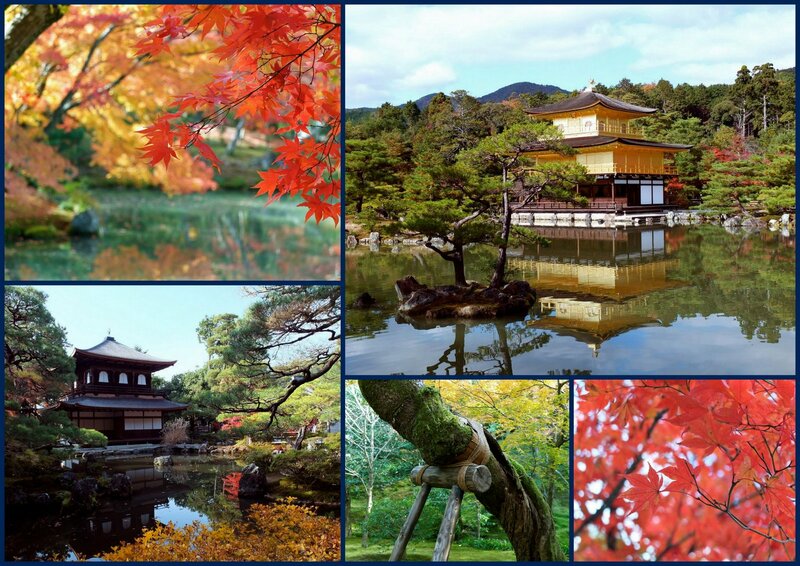 Clockwise from top left: koyo at Kinkaku-ji, Kinkaku-ji, more koyo, gardens at Ginkaku-ji (I love seeing propped-up trees), Ginkaku-ji. Clockwise from top left: lots of temples have a little spot for a cup of matcha and a sweet, Gion, Kinkaku-ji koyo, gardens at Ginkaku-ji. Have you visited Kyoto? Is there anywhere you think I should add to my list? Let me know! All opinions are my own and are expressed in a personal capacity only. All product reviews are based solely on my personal experience as a consumer. Similar performance is in no way guaranteed. I have no relevant professional or industry experience or expertise. I am in no way affiliated to any sites linked to from this blog, and cannot be held responsible for the content of any external site. Unless otherwise indicated, all content is copyright All Made Up / Nowhere To Go 2012-2014 and may not be reproduced without permission. Copyright All Made Up / Nowhere To Go 2012-2014. All rights reserved. Picture Window theme. Powered by Blogger.